While hard-hitting reporting on all matters of human rights has become Street Roots’ mainstay, vendor-contributed poetry has always been the nonprofit newspaper’s anchor. 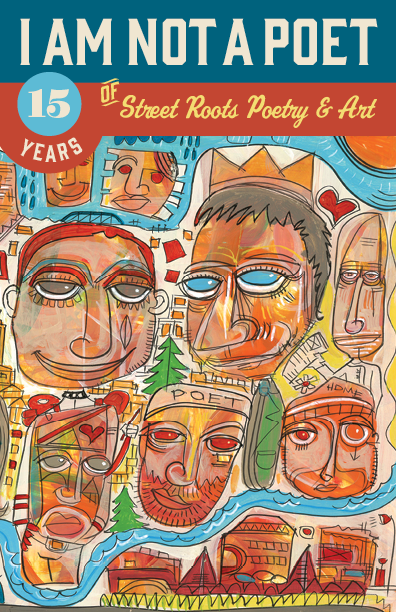 Recently, a number of Portland’s publishing professionals (PDX Magazine‘s associate editor among them) volunteered to comb through 15 years of Street Roots back issues to compile, edit, design, and publish an anthology of the most thoughtful, compelling, and enthralling poetry. In addition, PDX Magazine cover artist Chris Haberman contributed original art to the book’s cover, representing the myriad voices found in the anthology’s nearly 200 poems. Though not all, a number of the selected poems were contributed by those experiencing homelessness. Many of the published poems are created during the newspaper’s weekly writing workshop, where vendor-poets gather to express themselves through the written word. The result is a poetry anthology that examines all aspects of the human condition, not just issues of homelessness—issues that Street Roots actively works to alleviate. I Am Not a Poet: 15 Years of Street Roots Poetry and Art looks at themes of love, survival, hope, and humanity. The book also showcases art that tackles similar ideas, also sourced from previously printed Street Roots content. Enjoy this exclusive excerpt of poems from I Am Not a Poet. Copies are available in both e-book and print form, from a Street Roots vendor near you, at local bookstores, and online at the book’s website: IAmNotAPoet.org. that I was once beautiful. move to a better location?